Just a quick note before we get on with the rest of the day’s news. I’ll be speaking tonight as part of a panel discussing the Road Rules for Bicyclists, along with Sgt. Jon Aufdemberg, LAPD South Traffic Division, Bicycle Liaison; James L. Pocrass, Attorney, Pocrass & De Los Reyes, LLP; Cynthia Rose, Co-Founder, Santa Monica Spoke; and Lt. Marjory Jacobs of the LA County Sheriff’s Department. 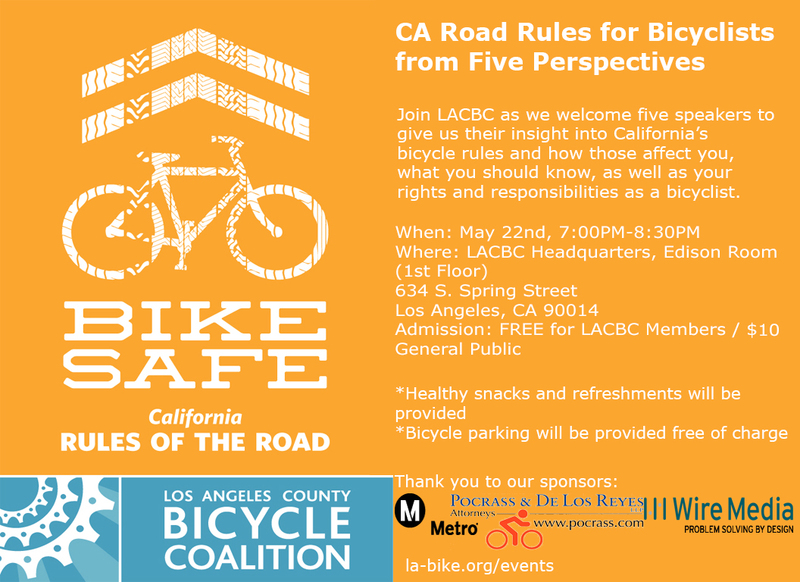 Presented by the Los Angeles County Bicycle Coalition, the panel discussion will mark the official unveiling of the coalition’s excellent new Bike Safe Rules of the Road pocket guide. Free refreshments and bicycle parking will be provided. Soto Street, Pedal.Pulse.Pride., Relámpago Wheelery, South L.A. Vision Zero, River Ride, and more!